(Photo courtesy of Utah Symphony) The Utah Symphony in rehearsal at Abravanel Hall. The symphony will be going more casual for its first Unwound concert, set for March 23. Sitting in Abravanel Hall with one’s eyes closed, a classical music fan would scarcely tell the difference between the Utah Symphony’s upcoming Friday night concert and its Saturday night show. It’s the same musicians, the same conductor — Thierry Fischer, the Utah Symphony’s music director — and mostly the same program, highlighting composer Andrew Norman’s new work, “Play.” Pianist Alexander Gavrylyuk will be the featured soloist both nights on Rachmaninoff’s Piano Concerto No. 2. It’s what the audience sees onstage, and experiences in the lobby, that will be different on Saturday. That night’s show is the first of the Utah Symphony’s new Unwound concert series, an experiment in knocking out some of the stuffiness that comes with listening to classical music. 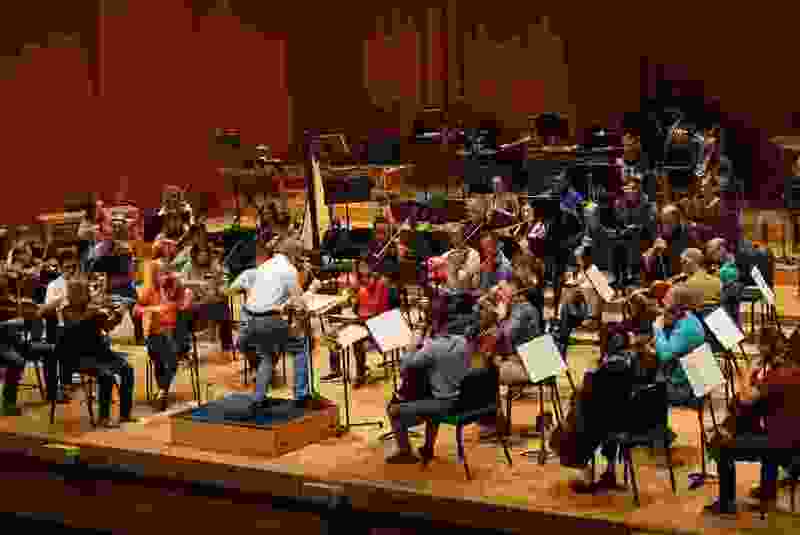 “We’re trying to deconstruct the concertgoing experience without deconstructing the concert itself,” said Jeff Counts, Utah Symphony’s general manager and the onstage host of Saturday’s performance. For Saturday’s concert, the audience is encouraged to dress casually. The orchestra’s musicians will follow suit, putting away the traditional tuxedos and evening gowns that they will sport for Friday night’s performance. “It will feel nice to match our audience more,” said Kathryn Eberle, violinist and the Utah Symphony’s assistant concertmaster. Dramatic lighting will be synced to the music, and video screens will help showcase parts of the show, such as a close-up of Gavrylyuk’s hands while he plays the Rachmaninoff concerto. “You can see how physical he has to be and how fast he has to be,” Counts said. At one point in “Play,” she said, the violinists hold their bows above the strings for three or four bars, heightening the anticipation of what’s to be played. “That is visually very stimulating,” Eberle said. More informal touches are planned in the Abravanel Hall lobby before the concert. Before the concert, Jimmy Martin and Shannon Barnson, from the popular “Geek Show” podcast, will host a “trivia night” in the concert hall’s First Tier Room. After the concert, Fischer, Gavrylyuk and Norman will take part in a Q&A session. Counts said Utah Symphony is hopeful the first Unwound concert will be a success. Programmers are confident enough that they have planned two more next season: For Gershwin’s “Rhapsody in Blue” on Nov. 16, and for “Carmina Burana” on March 28, 2020. Where • Abravanel Hall, 123 W. South Temple, Salt Lake City. When • Friday, March 22, 7:30 p.m.; Saturday, March 23, 7 p.m.
Tickets • $15 to $66, in advance at arttix.artsaltlake.org. Friday’s concert • Rachmaninoff’s “Vocalise” is also on the program. Saturday’s concert • The first of the Utah Symphony’s Unwound concerts, to provide a more casual concertgoing experience. Highlights: A shorter program (only the Rachmaninoff piano concerto and Part 1 of “Play” will be performed), with an onstage host, visual elements on the stage, beer for sale in the lobby before the show, and a trivia night in Abravanel’s First Tier Room from 5:45 to 6:30 p.m.